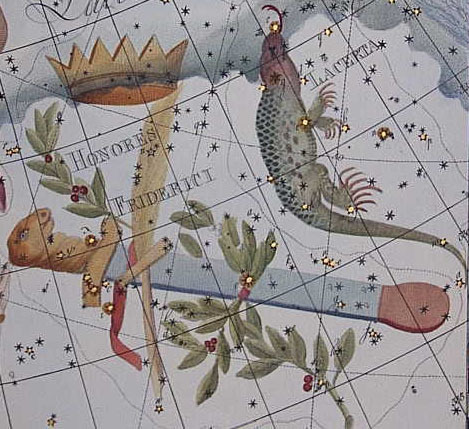 A modern constellation created by German astronomer Johann Ehlert Bode between 1787 and 1790. He created the constellation in order to honor Frederick the Great of Prussia, who had died in 1786. The constellation is primarily composed of a royal staff and crown, surround by a wreath of laurel. The constellation can be found between Lacerta, Cassiopeia, and Andromeda. The constellation was originally called Friedrich's Ehre, and has also been known as Gloria Frederica or Gloria Frederici. The constellation is no longer recognized and its stars have been returned to the constellations of Andromeda and Cassiopeia.